Cam type locks have been widely used and given dependable service for many years. May be used on single doors, double doors, or end gates. Ideal for refrigerated or van bodies. Reversible for right or left hand doors. Available with two locking points. Handle may be located at the most convenient point. 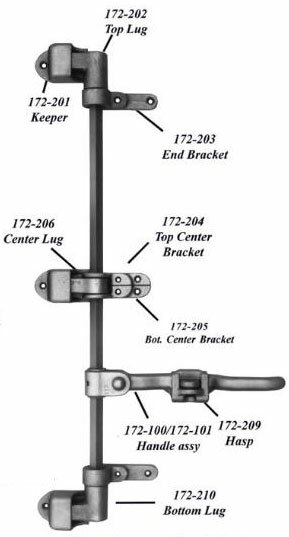 A rugged lock with ample leverage to clamp door tight or break frost seal. Padlocking handle. Note: Pad lock not included. 5/8″ Square Steel Rod Supplied Separately. Cam type locks have been widely used and given dependable service for many years. May be used on single doors, double doors, or end gates. Ideal for smokers, refrigerated or van bodies, ice cream trucks. Reversible for right or left hand doors. Available with three locking points. Handle may be located at the most convenient point. A rugged lock with ample leverage to clamp door tight or break frost seal. Padlocking handle.